A study conducted at the University of Toronto under the direction of Professor David Jenkins found that combining the best cholesterol lowering foods can reduce cholesterol naturally and just as effectively as statin drugs. In fact, Jenkins believes based on his research that using a diet instead of drugs has a better long-term ability to reduce cholesterol because many people taking statin drugs get a false sense that the pill is all they need. Lifestyle changes need to be a part of any plan to reduce cholesterol. The subjects in the University of Toronto study had better results by sticking to a diet that contained many cholesterol-lowering foods over those who only made one or two changes to their diet. The diet they used was a seven-day menu of cholesterol reducing foods. Fifty-five participants followed this diet as a part of their everyday lives for one year, meeting every two months to discuss their progress. Within the year, approximately one-third were able to reduce cholesterol naturally by about 20%. This is the same type of average result seen with statin drugs, but without any of the side effects. Most of the study's participants reported that it was easier to add just one or two cholesterol reducing foods to their diet at a time. The drastic change made it difficult for some to adjust, especially if their lifestyle did not previously include such foods. The greatest benefits were seen when several of the healthy foods were a consistent part of the diet. These foods included specific vegetables and healthy sources of protein. The directors of the study concluded that much can be done to improve overall health with diet, and especially reduce cholesterol naturally. 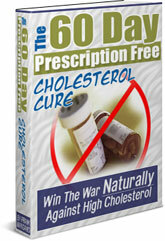 To learn more about how to reduce cholesterol without prescription drugs, you can get The 60-Day Prescription Free Cholesterol Cure.